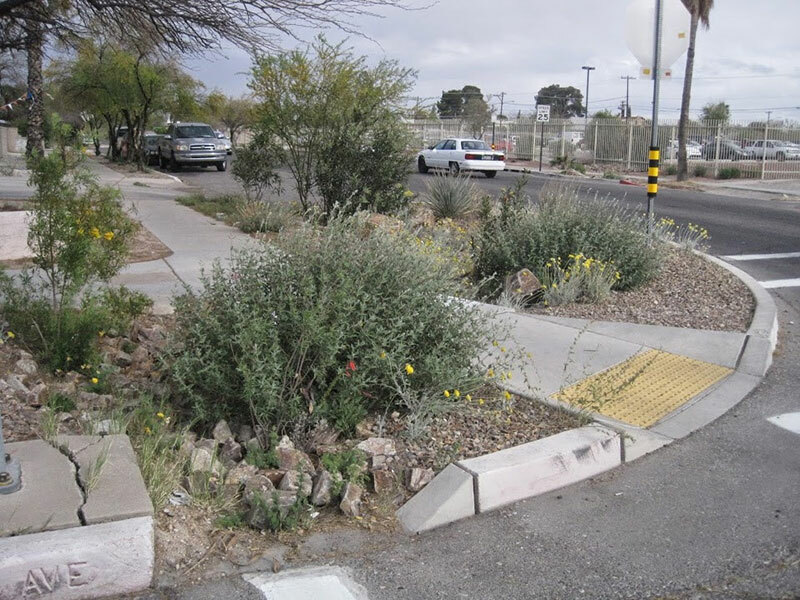 Stormwater management design in the City of Tucson, Arizona incorporating low water use vegetation. Photo credit: US EPA. In addition to public health and safety, flood control objectives, stormwater codes, and standards for new development can protect watercourses and water resources. This is largely achieved by promoting practices to ensure that post-development runoff rates do not exceed pre-development rates. Impervious surfaces, such as roads and parking lots, are in many cases the most significant contributors to stormwater runoff in a community. Conventional development and storm system design inhibits natural hydrologic function because large impermeable surfaces prevent runoff infiltration and groundwater recharge, increase the volume and rate of runoff, discharge polluted runoff into watercourses, and cause erosion from increased peak flows. An increasing number of communities are including low impact development (LID) as a stormwater management option in their stormwater codes. The goal of LID is to “reduce runoff and to mimic a site’s pre-development hydrology by minimizing disturbed areas and impervious cover and infiltrating, storing, evaporating, and detaining stormwater runoff close to its source.” LID features may include small infiltration basins that can be used to establish vegetation in new development, including trees that reduce air temperature and provide shaded walking areas when located adjacent to parking lots and roadways, providing additional benefits in addition to recharge and runoff reduction. Codes that require or incentivize LID design can reduce or eliminate the need for conventional large detention ponds and flood control structures, and cost less than conventional techniques. To ensure codes are properly implemented, inclusion of LID design standards for site planning, identification of best management practices, and maintenance are particularly necessary because LID is a comparatively new concept. Where stormwater detention (“dry”) or retention (“wet”) basins are necessary, they can be designed to provide additional benefits, such as recreational uses, in addition to stormwater management. Faced with historically limited surface water and groundwater resources, Flagstaff has made significant progress in expanding its water portfolio to include use of alternative water supplies, such as effluent and rainwater. Adoption of a rainwater harvesting ordinance in 2012 was precedent setting in Arizona and led to revisions of its low impact development and stormwater manuals. Flagstaff first adopted an LID Guidance Manual in 2009, recognizing the many benefits of LID practices such as reducing runoff and flooding, and improving water quality. The manual provides extensive information on methods to incorporate LID design into development, including site planning practices, engineered and other best management practices (such as use of swales, porous pavement, bio-retention basins, street design and curb-cuts), and maintenance considerations. Three years later, Ordinance 2012-03 added a new chapter to the LID Guidance Manual and amended its Stormwater Management Design Manual to comply with new rainwater harvesting requirements. In its resolution, the City recognized the need for rainwater harvesting due to the persistent drought and the need to “successfully manage and coexist with the resource limitations” of the area. The Stormwater Manual now recognizes the benefits of LID to control increasing runoff volumes from impervious areas that had resulted in the need to upsize the City’s storm drain systems. It also recognizes the role of LID in reducing the costs of upsizing downstream infrastructure by reducing flow volumes. The manual also notes how LID can reduce the amount of some runoff pollutants and promote water conservation by allowing for the reuse of stormwater and directing flow to landscaped areas. The new rainwater harvesting Chapter of the LID Guidance Manual provides design guidance for rainwater harvesting components, such as cisterns, and collection and conveyance systems, as well as design specifications for gutters and downspouts, pretreatment (e.g. filters), and storage tanks. Construction and maintenance recommendations are also included. Flagstaff requires stormwater LID for all new subdivisions, commercial and industrial developments, re-development of non-conforming sites, and other developments greater than ¼ acre in size. There are some exceptions, such as waivers for both single-family residential structures that are not part of a new subdivision, and for larger lot subdivisions with appropriate demonstrations of no adverse downstream effects. The requirement to infiltrate or reuse the first inch of rain from an impervious surface was phased in over two years to replace a previous requirement. Active rainwater harvesting systems (tanks) are also required for new developments other than single family residential, except where landscape water needs can be met with other non-potable water or where the developer uses only native/drought tolerant plants and passive rainwater harvesting for irrigation. The Pima County Regional Flood Control District Manual contains specifications for LID structures and multiple-use and multiple benefit concepts.